I took my new Camry SE into the dealership @ 4800 miles for an oil change and tire rotation. They damaged the car while they had it. The tech "forgot" to put the lug nut on and the wheel feel off. 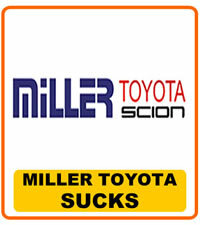 Miller then gave me my car back and did not tell me about the damage. They had my car parked against the trees and I was unable to see the damage. Later that day when I was getting back into the car and came around to the other side I saw the damage and called them immediately!! They said "uh yeah there was a little accident while you were here and you left before we could tell you". They have been lying to me ever since and still to this November 30, 2007, the car was damaged on October 11, 2007. They told me that after that car came back from the body shop I would turn it in and get what the car was worth before the accident. Then today (nov 30th) they say that the bodywork is terrible and that they are no longer liable and that I now have to fix the damage on my own. They also said that they are going to show up at my work on Saturday to take the rental (that was not the car that they told me i would get. The service manager told me I would receive a car that was comparable to mine...not the case at all)from me and give me back my car. A car that is not in agreement with what they had said about fixing it and then turning it in and giving me the value. They have told me that they are wiping there hands clean of everything and are no longer responsible. They have been rude to me from the very start to say the least. I have been told many different stories about the consequences to the tech that damaged the car ie: he was fired and had to pay all the damages because this was his 7th time damaging a car, or that he was not fired but has to pay the deductable and is on probation ect. Needless to say at this point its in the hands of my lawyer. If anyone is ever thinking about getting a Toyota don't do it!! More importantly never from MILLER TOYOTA OF MANASSAS VA!!! !